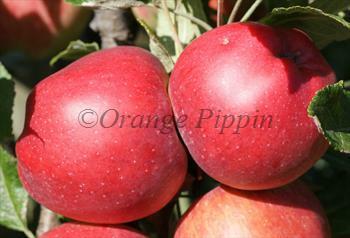 Chieftain is one of those apples that is not particularly well-known, but is popular with those that grow it. It is a cross between two classic American apples, Jonathan and Delicious, and the result is a nicely-balanced apple which is still sweet like Delicious but has a bit more interesting tartness to its flavor. Fill in the details below and we will let you know when Chieftain apple trees are back in stock. Chieftain is reliable and easy to grow and has some natural resistance to scab and fireblight. Developed at Iowa State University at the start of the 20th century, but not released until 1966.